Judy Goodman is one of Britains leading animal artists, which is why her work continues to be well respected and sought after by the equestrian community. Judy is a regular contributor to the local and national media, often featuring on BBC Radio, talking about her love of horses, the current equestrian scene in Britain and her work as an artist capturing those key moments of sporting life from the major race meetings to the stable setting. 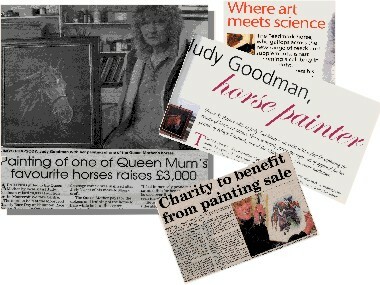 Her enduring passion and dedication to capturing a horses unique charactor can be seen in all her work, which is why when her paintings are auctioned for charity, a Judy Goodman original can reach thousands of pounds. As a sponsor of the Moorcroft Racehorse Welfare Centre in Slinfold, West Sussex, Judy continues to donate her work to raise funds for the rehabilitation and retirement of the subjects of her lifes work, that she translates from stable to canvas. Assessment, re-schooling and re-homing of thoroughbred racehorses which have finished their racing days.